JCB used the Executive Hire Show at the Ricoh Arena in Coventry, UK, this week (February 6-7), to unveil a new machine (a vibratory tamden roller, the CT260) as well as to show its new mini electric excavator, and a 1 metric ton dumper, both announced last year, in public for the first time. The excitement surrounding the new machines was tinged with disappointment, for some, as the long-rumoured news that JCB would not be exhibiting at this April’s Bauma expo in Munich, was confirmed. A spokesman said the company is instead focusing on “more personalised, customer focused activities”. The OEM will certainly be missed at the event which expects to attract over 600,000 visitors from all around the world. But this week in Coventry JCB was certainly one of the stars of the show, with its new machines capturing visitor attention. 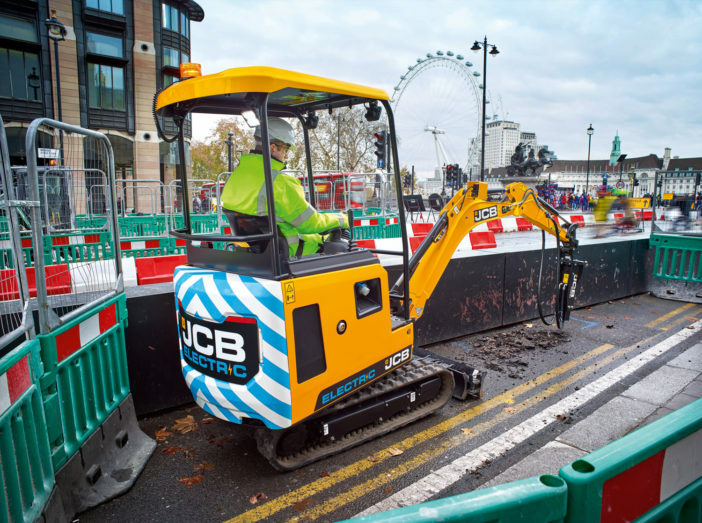 The 19C-IE mini excavator (above) is a powerful, compact model, delivering the performance of the company’s conventional diesel-powered 1.9-metric ton model but with zero exhaust emissions and significantly reduced noise levels. 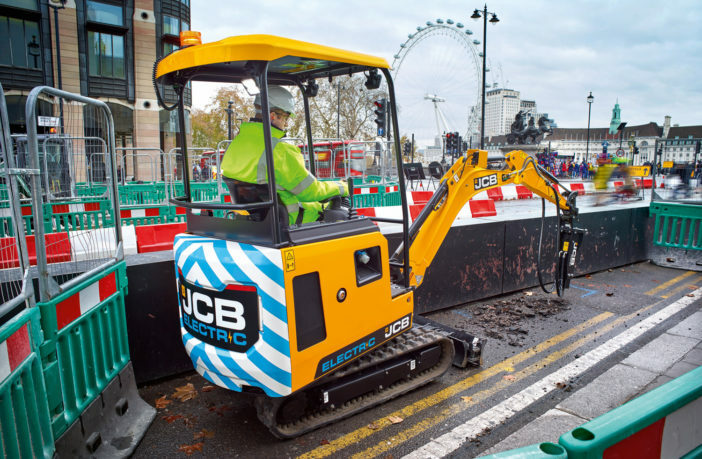 Powered by three or four lithium-ion batteries, the vehicle provides 15kWh or an optional 20kWh of energy storage – enough for a full working shift for the majority of mini excavator operators. Initially equipped with both 110V and 230V charging, a fast-charge option will also be available as an option. Using a 48V electrical system, a highly efficient electric motor delivers instant torque, to power the machine’s Bosch Rexroth-supplied load-sensing hydraulic system. This delivers the digging performance as the standard 19C-1. The hydraulic system also delivers a 32 l/min twin flow auxiliary circuit and the mini comes with an integrated handheld hydraulic tool circuit option. The high efficiency of this advanced electric-hydraulic combination means only a small hydraulic cooler with a small thermostatic electric fan and no engine radiator, which contributes to longer battery life and the lower noise level. 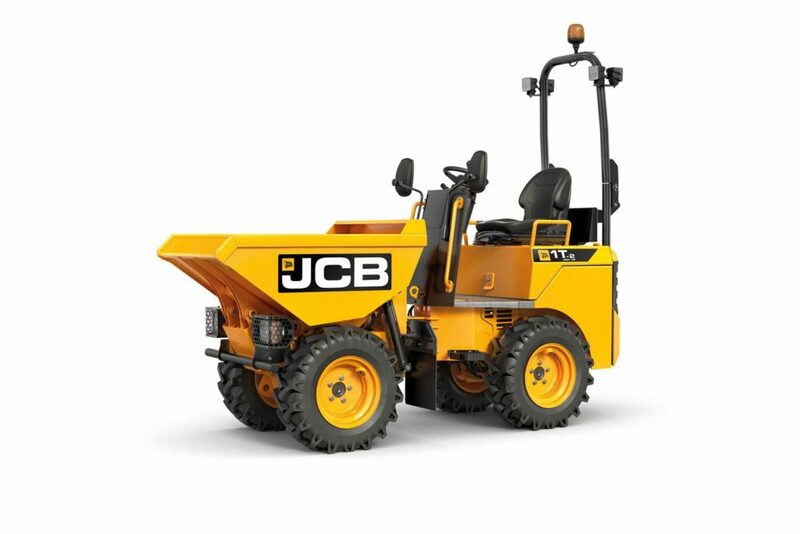 The OEM’s new site dumper, the 1T-2 (above) benefits from a series of safety features including the in-house-designed seatbelt system that prevents the machine being operated without lap belt engagement. Fitted as standard is a parking brake button that locks the drivetrain to ensure the machine remains stationary, while an audible movement alarm alerts any bystanders to imminent movement by the vehicle. With an operating weight of 1,515kg and a payload of 1,000kg, the new machine also sees the introduction of a 16.1kW Tier 4 Final/ EU Stage V certified diesel engine. Its hydrostatic drivetrain with intuitive pedal makes the compact machine ideal for both novice and experienced operators. The new CT260 (below) tandem roller is available in two drum sizes – 1,000mm or 1,200mm widths. 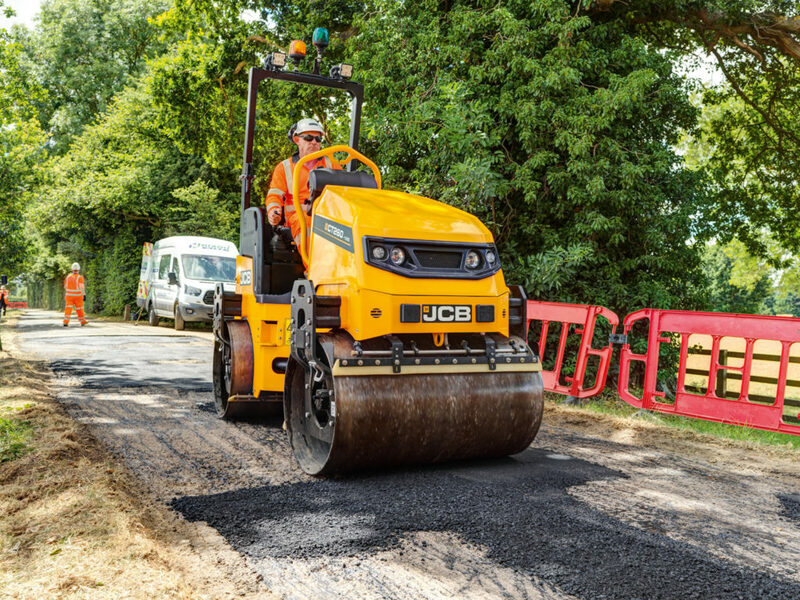 Built for both asphalt and base layer compaction, the vehicle provides good operator visibility on both sides of the drums due to its new hourglass design. Access to the driver’s seat is possible from both sides of the roller and the operator space includes anti-vibration mounts for improved comfort. Powered by a proven Tier 4 Final, EU Stage V-certified engine that uses mechanical injection and no diesel particulate filter (DPF), the vehicle offers an operator-present seat switch for a timed cut-out delay, to allow free movement on the seat during operation.